There’s a movement among Christians today towards what’s called Christian Universalism. It’s a belief that everybody ultimately will be saved—there will be no Hell, or at some point Hell will be depopulated and everyone will live forever with Christ in Heaven. It’s a wonderful thought. But does the Bible really teach it? A lot of people look at all the passages where Jesus talks about Hell and immediately and intuitively realize that no, of course that’s not taught in Scripture. But at the same time, there are passages (which I believe are taken out of context) that “Christian Universalists” cite to prove their viewpoint. I heard in an interview a Christian Universalist (C. Baxter Kruger) say that there are (according to this passage), 1) those who know they have been reconciled to God in Christ, and 2) those who do not yet know they’ve been reconciled, but the point is that all of us have been reconciled and one day all of us will know that. That sounds pretty persuasive to a lot of people. It certainly sounds attractive. (Here’s a video in which Baxter Kruger doesn’t say that, but something quite similar. Krueger is now regularly making presentations with Paul Young, author of The Shack. You may wish to see my blog I wrote about the book). Picking back up in verse 20, Paul says, “We are therefore Christ’s ambassadors, as though God were making his appeal through us. 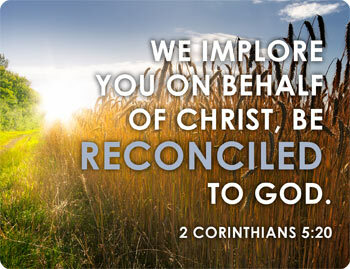 We implore you on Christ’s behalf: Be reconciled to God.” What’s he saying? He’s saying that you need to be reconciled, so get reconciled, “be reconciled.” Whatever it means that God was in Christ reconciling the world to Himself, therefore, it does not mean everybody is already reconciled in the sense the word is used in verse 20! Maybe it means that God did a work of reconciliation that is available to all people and He’s already accomplished that. But to say that this is teaching Christian Universalism negates the larger context, where Paul is challenging believers to go forth as Christ’s ambassadors to take the gospel to the world, that people may be reconciled to God! There’s numbers of places in the book of 2 Corinthians that refer to believers and unbelievers. In the very next chapter Paul talks about not being yoked together with unbelievers, contrasting light and darkness (2 Corinthians 6:14-18). Clearly Paul’s entire argument rests upon there being a fundamental distinction between regenerate and unregenerate people. Can you imagine him saying that the unbelievers God’s people are not to be yoked with are already reconciled to God just as we are, but just don’t know it yet? No, this is a radical distinction, not just in the potential, but the actual, not in just what is known or not, but what is true or not. What shall we say about Colossians 1:13, “For he has rescued us from the dominion of darkness and brought us into the kingdom of the Son he loves”? Is our message to unbelievers to be, “God has already rescued you from the dominion of darkness and brought you into Christ’s kingdom—we just need to tell you”? Is it that “you have already been born again, we just need to tell you”? That “you are already going to Heaven, Hell isn’t even a possibility, and that’s the good news you can enjoy, whether or not you believe it”? Do we say repentance and turning from sin to trust in Christ’s atonement is necessary, or do we say “repentance doesn’t matter, you’ve already been forgiven, you just don’t know it, and haven’t asked for it, but it’s true anyway”? What’s true of 2 Corinthians 5 is true of all the so-called Universalism passages. If you take them as one verse by itself, it can sound like all people will eventually be saved. But when you compare it to all the other passages, numbers of them spoken by Christ Himself, then you realize that’s a myth. Jesus said there’s a wide road and a wide way that leads to destruction, and there are many who go through it. He also said straight is the gate and narrow is the way that leads to life, and few there be that find it (Matthew 7:14). Yes, there will be people from every tribe and nation and language in Heaven, as Revelation 5 and 7 makes joyfully clear; but to say all people will be there is to do great violence to countless passages, including those where Jesus emphatically speaks of the fearful reality of Hell. The message of “Christian Universalism” sounds like good news, but it is ultimately a false message that sabotages and undermines the true good news of the Gospel of Jesus. There are people I respect greatly who love this book, without qualification, and consider it a great gift of God to thirsty people. There are others I respect as much who are deeply concerned about the book’s messages, both overt and subtle, and their impact on people.